A couple of weeks ago, as I was perusing through the Pioneer Woman's blog looking for a particular recipe (a.k.a. 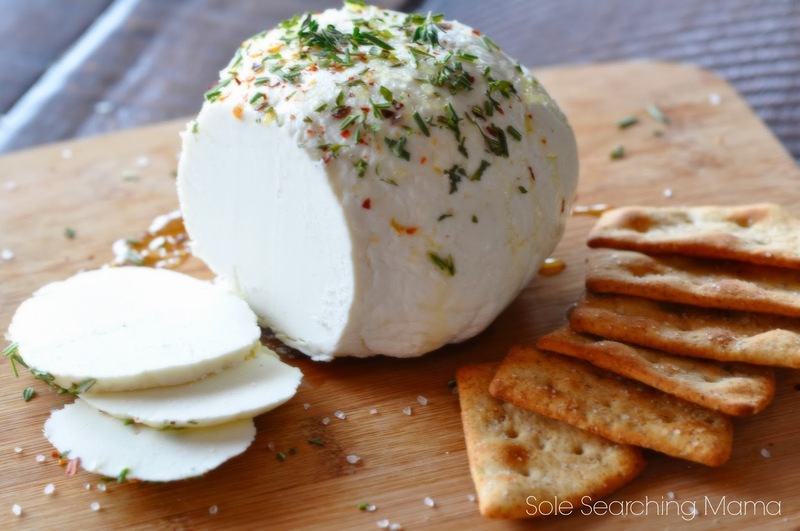 laundry avoidance), I stumbled onto a post she had written on how to make homemade mozzarella cheese. Fun! I thought to myself (I was probably eating chocolate and laying on the couch at the time) scrolling through her display of gorgeous photos and seemingly simple instructions. She had gathered together a group of her girlfriends for the project, and they probably had wine with their cheese, which, in my imagination, made the idea of giving the recipe a try even more tolerable. So, the happy (determined) little thought of, "if PW can do it, I can do it!" popped in to my head, followed by, I'm gonna gather me up some boys and do the same dern thing (minus the gorgeous photos and ease and simplicity and effortlessness and pretty, neat and tidy kitchen of course)! 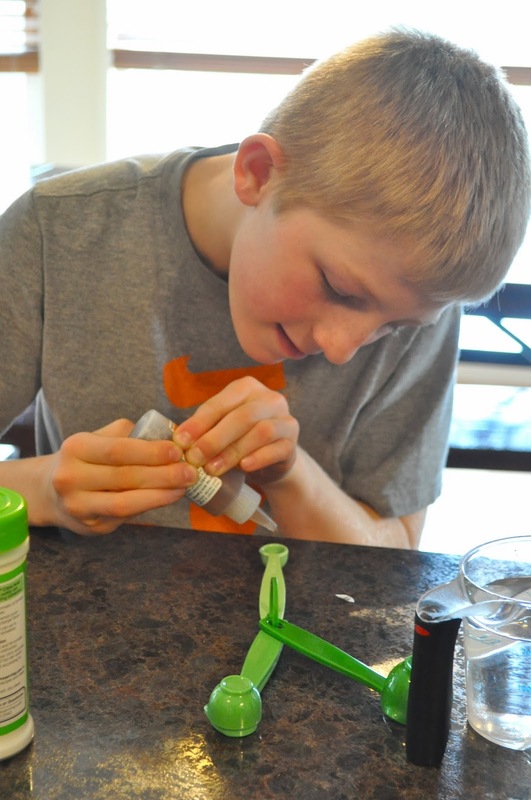 The discovery of the recipe happened to occur just after the completion of a science experiment the boys had practiced which focused on the behaviors of acids and bases during our study of chemical changes. Since my education degree includes and emphasis in middle school science, I'm a sucker for methodology, and I can't resist a great book of experiments. I'm really enjoying the Focus on Elementary Chemistry series right now, and thankfully, so are the boys! One of the beauties of homeschooling is it offers ample opportunities to extend the elements of a lesson into a practical application. Making homemade cheese was the perfect conclusion to our acid/base experiment. Before I go all crazy over the details of how fabulous homemade mozzarella cheese is, you should know that our first attempt was a complete failure! I was a little nervous from the start, since I've never made cheese before. And, true to my instincts, it was a flop! But, good scientists never give up, they just try again (and again) making necessary adjustments along the way. That evening, I found several websites (including this one and this one) that also gave instructions for cheese making, and many of them had recipes that were slightly different from PW's. The next day, with a few little recipe tweaks in my notes, we set out to restore our cheese making egos! This time, the revised recipe worked! Simple ingredients! Amazon sent me animal rennet instead of the vegetable rennet that I ordered. Before sending it back, I consulted some cheese making experts to see if it mattered which form I used. Really, either one is fine! and a healthy dose of child labor. Have you tried bottled milk?? It will change your life. Really, it's that good! (This child is not a paid actor for Hildebrand Dairy, he's not even acting, if we had our own milk cow he would probably keep it in his room. ) Leche de amor! When the citric acid is dissolved in the milk, and the mixture is heated, the milk begins to curdle. This is a good thing! The longest 10 minutes of a cheese maker's life. The instructions said to remove the curds from the pot with a slotted spoon, but I found that if you also strain it over a cheese cloth it speeds up the initial whey removal process. The cheese cloth keeps the curds contained, making it easier for the kids to squeeze out the remaining whey. 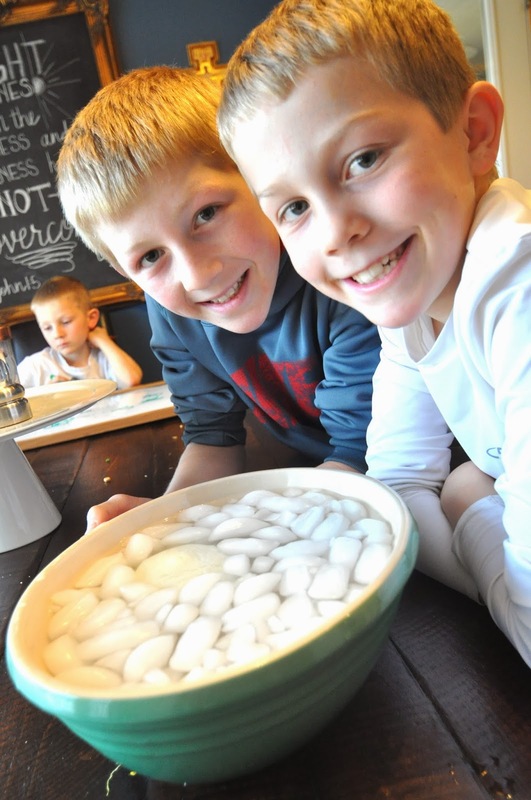 The boys pretended to be grossed out, but all you boy moms out there know they really loved it! 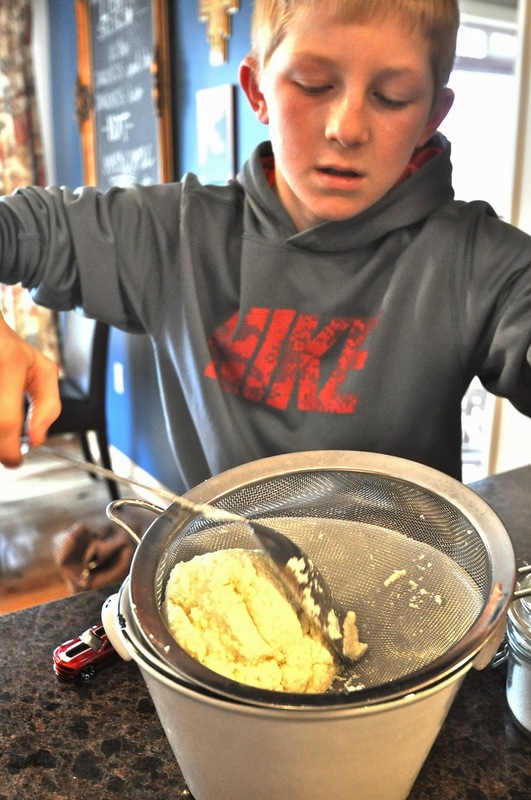 As an alternative to many of the methods that recommend squeezing the whey from the curds (between microwaving) by using your hands, we chose to press the curds using a large spoon over a strainer, because the curds were simply too hot for the boys to handle, and I wanted them to do the work! 1. Her recipe calls for 1.5 teaspoons of citric acid, and we used 2 full teaspoons, and we did not dilute it in water first. 2. We allowed our mixture to heat to 95 degrees on the stove instead of her recommended 90. 3. In the step where you remove the mixture from the heat, cover and wait 5 minutes, we waited for 10 minutes. 4. Our microwave is very hot, so we used 80% power for 30 seconds instead of 35. 5. 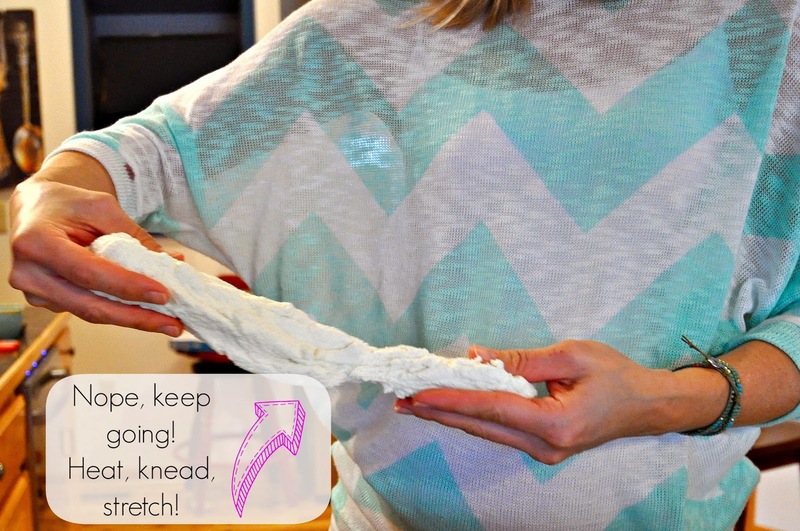 She doesn't mention it in the instructions, but as you knead and stretch the cheese, it should eventually become soft and smooth, but if it doesn't, continue to heat the curds the microwave, repeating the knead/stretch process until the desired consistency is reached. It took us 2 additional uses of the microwave-knead-stretch process before ours finally became smooth. When it came time to knead and stretch the cheese, I took over from there, because the cheese has to stay hot for it to remain workable, and the goal is to get a nice, smooth cheese, not a crumbly one. After the cheese is neatly shaped into a ball and cooled in the ice bath, it can be eaten immediately, or stored in the refrigerator for future use. Before storing ours, I dipped the ball of cheese in the cooled whey to keep the outside of the cheese from getting too dry, then I wrapped it tightly in plastic wrap. Our finished cheese still was not as smooth and soft as we had hoped, mainly because the boys were running out of "no whey!" and "who cut the cheese!" jokes, and really wanted to go outside and play in the snow. When it came time to sample our efforts, we topped the cheese with olive oil, fresh herbs, red pepper flakes and coarse salt (as PW suggests) and served it with our favorite crackers. It tasted delicious! P.S. Be sure to save the whey! It's a very healthy addition to soups, smoothies or it can be used as a liquid substitute in baking! 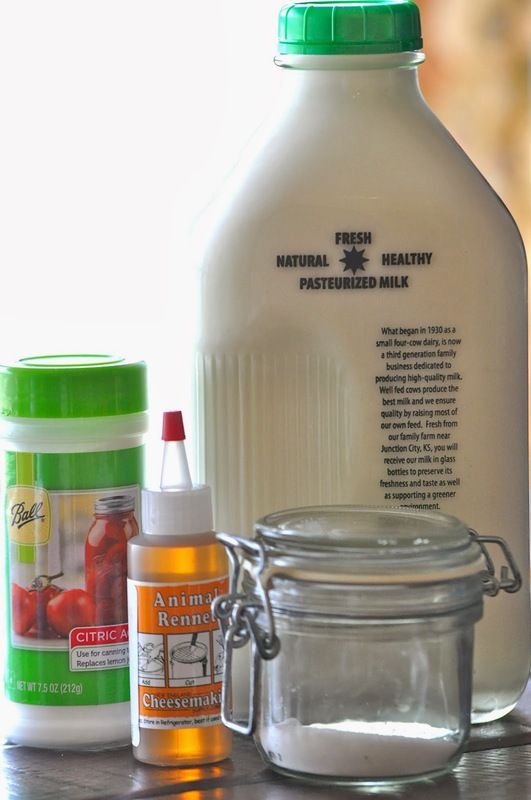 Here's 16 uses for whey from the Prairie Homestead! 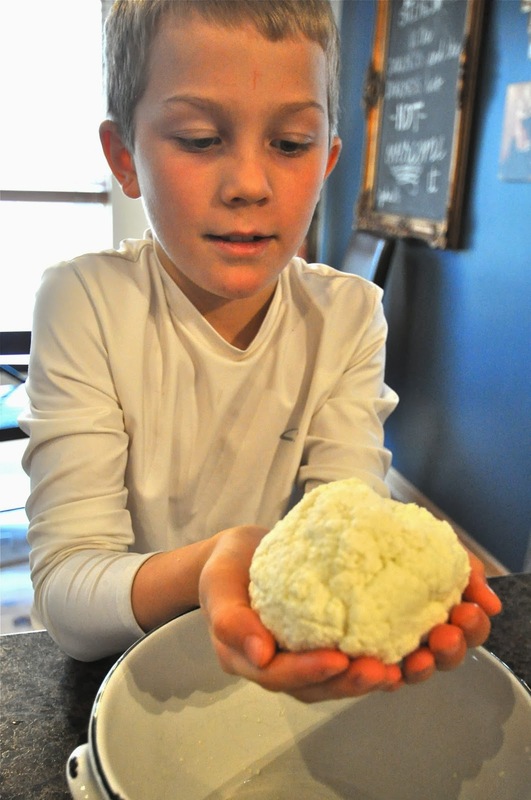 Also The Prairie Homestead's instructions for making mozzarella were wonderfully detailed and easy to follow. You might be my hero!! Just the thought of making cheese does me in and then to get the boys involved - OY!!! On a different not - I didn't realize that you education degree had an emphasis in middle school science. In my other life (before kids) I taught middle school science. I'm actually still certified (in TX) to teach any secondary science. That's awesome, Kim! It's fun discovering new things I have in common with other bloggers. I'm thankful for my ed degree, but it's also made it a challenge to figure out how to step away from the traditional classroom in technique and style to teach more effectively at home. This is my dream. Seriously, I've wanted to do this since reading Animal, Vegetable, Miracle years ago. Your boys make it look so fun, and oh my stars, that last picture has my tummy rumbling! Animal, Vegetable, Miracle is on my list of books to read. Did you enjoy it?? Making cheese could become an addiction, it really was that much fun! I was just reading about making cheese yesterday in Animal, Vegetable, Miracle! I am enjoying it, for what it's worth. :) And your cheese looks so yummy, Susan! I am completely impressed. The boys look like they are enjoying themselves, the cheese looks great, and you did it all in a pretty top and jewelry. :) Way to bring science into real, practical life. My kids would also be making cut the cheese jokes the entire time. Boys are so grossly funny.